The Lighthouse is a luxury beach house set on the stunning North Beach of Jolly Harbour on the Island of Antigua with a central courtyard enclosing an inviting pool, a gentle water-fall, and surrounded by a spacious covered terrace. This villa itself has a grand open plan living area with high vaulted ceilings and beautiful stone tiling throughout. This fantastic space has glass sliding doors, stretching right across the lounge area which fold right back to reveal impressive Caribbean sea views. There is also a fully equipped, designer kitchen with all necessary appliances and a breakfast bar. The villa has six en suite bedrooms in all, one which is presently being used as a large office; the sixth bedroom has its own kitchen and living room, perfect for visiting guests or family. The lovely white sand beach in the protective bay is perfect for swimming. There are lush, tropical gardens surrounding the villa and terrace. At the front of the villa is a mooring facility in the marina, which includes a boat lift and boat house. The villa is approx 7500sqft in size and the plot is approx 12,000sqft. Set in Jolly Harbour this villa enjoys the security of a gated community as well as all of the wonderful facilities that Jolly Harbour has to offer. 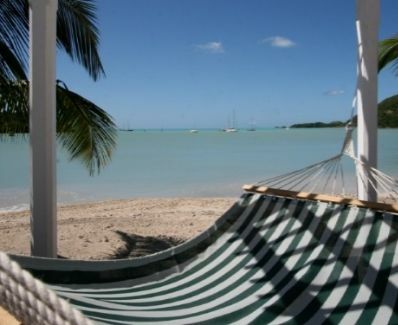 It’s just 20kms to Airport and flights to Antigua are just eight hours. The guide price is £2,087,900. For further information please contact Savills on 0207 016 3740 or visit www.savills.co.uk/abroad.